Hello, all -we're back home from a weekend of Thanksgiving feasting! Now that we're (some of us anyway) are full and slightly dulled and snoozy from whatever-it-is-in-turkey-that-moonlights-as-a-sleeping-drug, here is the theory-heavy Part 2 of Waist-Hip Shaping! Cruel! Cruel! 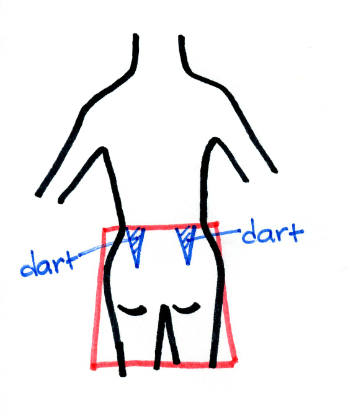 We also looked at how to reduce unwanted ease with the first method, darts. Q: How do we know which method to pick for a particular garment that fits badly? If the hips of a pair of pants fit, and the waist gapes, I'll use darts to reduce the unwanted ease that's localized in the waist area, but if the waist and hip are both baggy, I'll use seams. If the chest of a blouse fits, but the waist is baggy, I'll use darts to reduce the unwanted ease that's localized in the waist area, but if the blouse is baggy, I'll use seams. 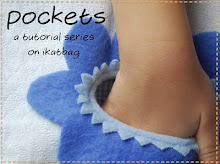 There are many instances in which you might need a combination of both methods -seams and darts - and we'll also discuss that in theory in this post. Right now, let's jump right into two cases - one in which there is a little bit of unwanted ease, and the other in which there is a lot of unwanted ease. Suppose you've lost a little bit of weight and your skirt now feels a little loose all over in the waist and hips. Maybe the excess ease is about 1" total in the waist and 1" total in the hips and you can tell with a simple pinch of the fabric that the skirt is going to stay the same shape, just a wee bit narrower all down the sides. So we divide the 1" between the left and right side seams and take in 0.5" on the left side and 0.5" on the right side. 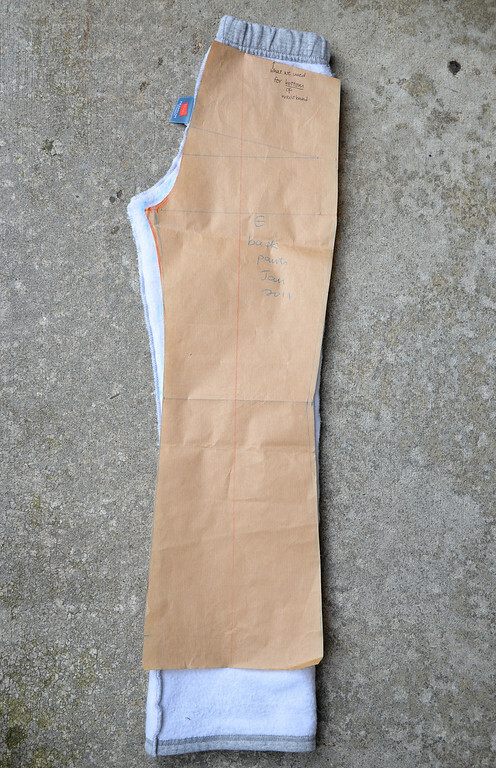 That would mean sewing in 0.25" from the original side seam on each side. 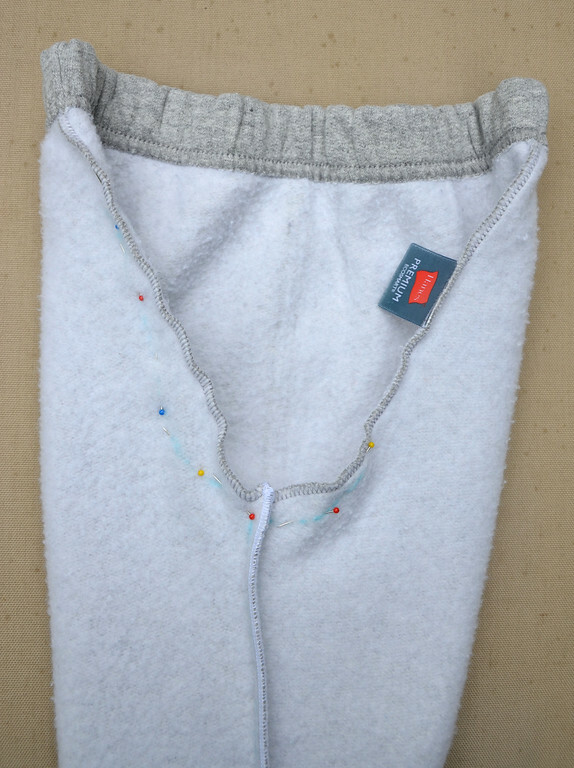 You wouldn't need to unpick the seam finishing - just sew a new line of stitching farther in from the original seam, and trim off the excess seam allowance. 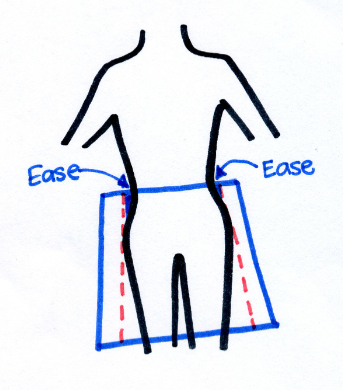 For a small reduction in all-over excess ease, this would work quite well without distorting any side seams. Suppose you've lost a lot of weight and your skirt now hangs loosely around your entire lower body, like a sack. You do some measuring and find there's about 4" that needs to be taken in around your waist and your hips. But because everything is so baggy, it's hard to tell exactly how that excess ease is distributed, or if the new, smaller fit is even of the same shape as the old, bigger one. 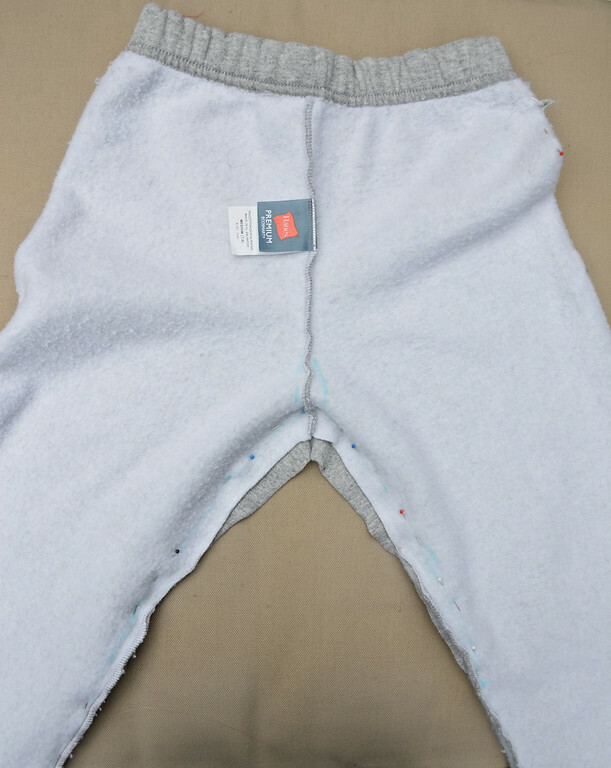 So let's start by doing what everyone instinctively does: we sew in the side seams. Let's forget for the moment whether we need to first unpick the tailored, faced waistband etc - we're just interested in how the garment eventually fits, OK? 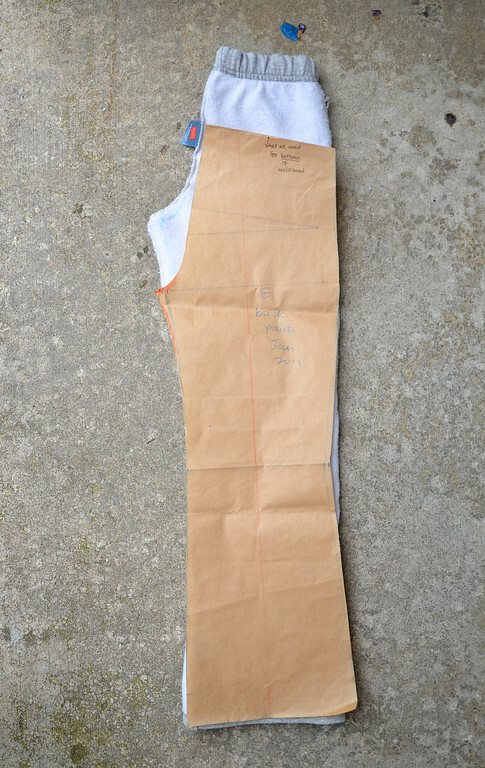 So press open the now-huge and very visible seam allowance (or trim and serge) and you're set! You try on your skirt and from the front (or back), it looks great! Ah, the side seam has skewed to the front. And there's pulling at the buttocks! And while your waist now fits, you can hardly move your legs. Why? Why? When you alter a garment by simply "sewing in" a seam, you're making both pieces of fabric involved in that seam smaller by the same amount. 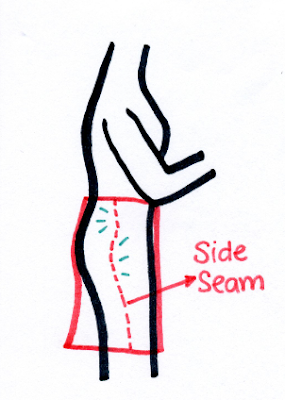 Since a side seam joins the front and the back pieces of a garment, you've taken in a total of 2" from the back and 2" from the front of the garment. 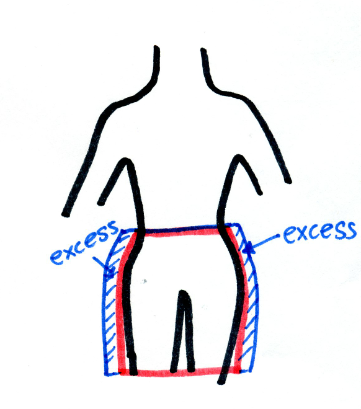 This might work at the waist, which is generally the same in the front and back, but not through the hips, which are bigger in the back area (the buttocks) than the front area (the abdomen/thighs). You have, in effect, forced a symmetrical alteration upon an unsymmetrical part of the body. which you'd then reduce by inserting darts (or making the pre-existing ones deeper) at the back, or front or both. Another alternative is to realign the side seams. This means unpicking the entire seams to separate the pieces of fabric, and creating new seams that take in different amounts from the front and back of the garment. 2" from the front waist and 2" from the back waist for a total of 4"
3" from the front hips and 1" from the back hips for a total of 4"
which would have allowed more room for the buttocks, and produced a completely vertical side seam with no pulling. 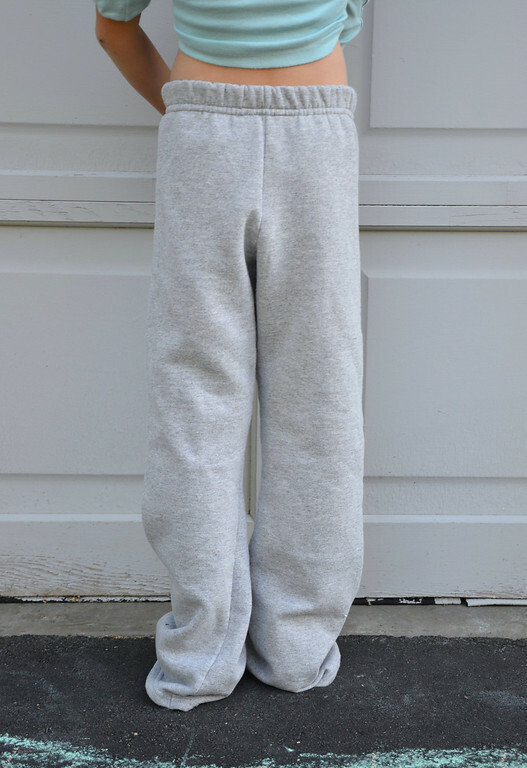 And here's the subject: a very baggy, saggy pair of sweatpants with a low crotch and general roominess around the entire thigh area. 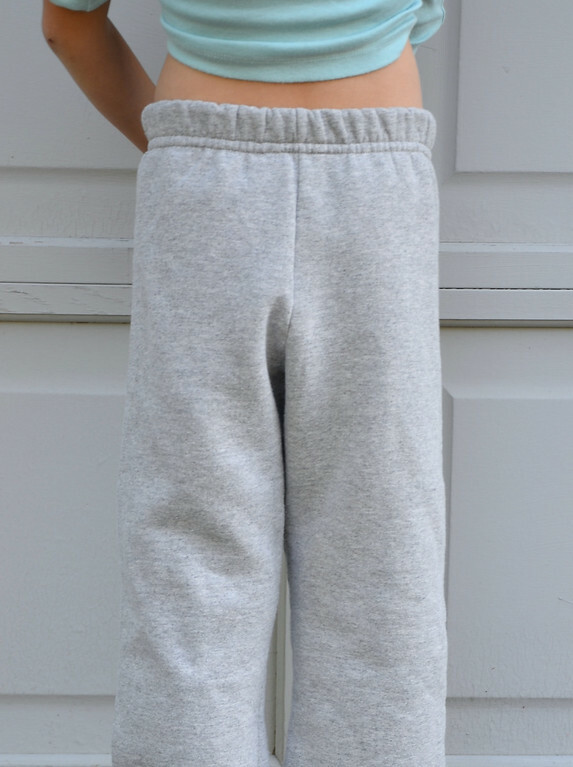 We bought this pair of sweatpants from Target in Emily's (supposed) size and she wore it the whole day with the waistband rolled over twice to keep it up, before letting me know "it is a bit big, but can we keep it because I love how soft it is inside?" Too late to return it now, so it had to be altered. And since there are no side seams (each leg was cut as one continuous front-back piece) the only seams to work with were the inseams and crotch seam. and laid it over this pair of sweatpants, turned inside out and folded in the appropriate configuration. 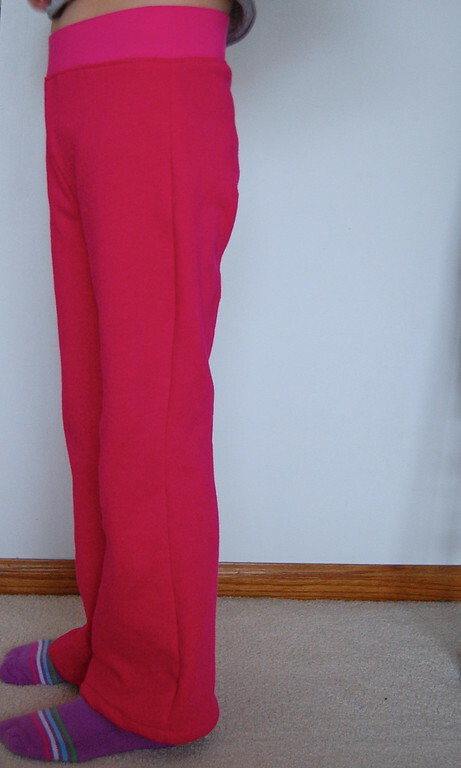 or (below) flush with the bottom hem (to keep the hem). I chose to keep the waistband, just because it was easier to sew a new hem than a new waistband. Here's what I want to point out: the new seam lines are not the same shape for the front and back pieces. In other words, I cannot simply sew a new crotch/inseam inwards from the old ones. They have to be realigned. than the front (which is flat and smooth). 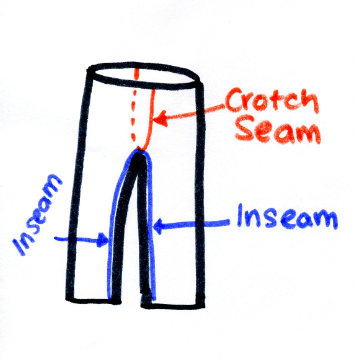 Pants which fit well should have a significantly roomier back than front because of the buttocks and for sitting. 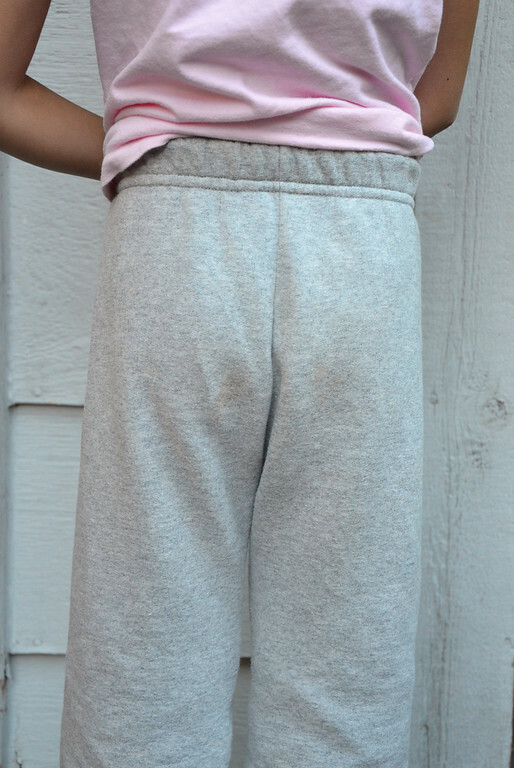 This pair of sweatpants was almost identical in back and front when we bought it. Insane, but then, it was, overall, so baggy anyway, that even the concept of "fit" was moot. 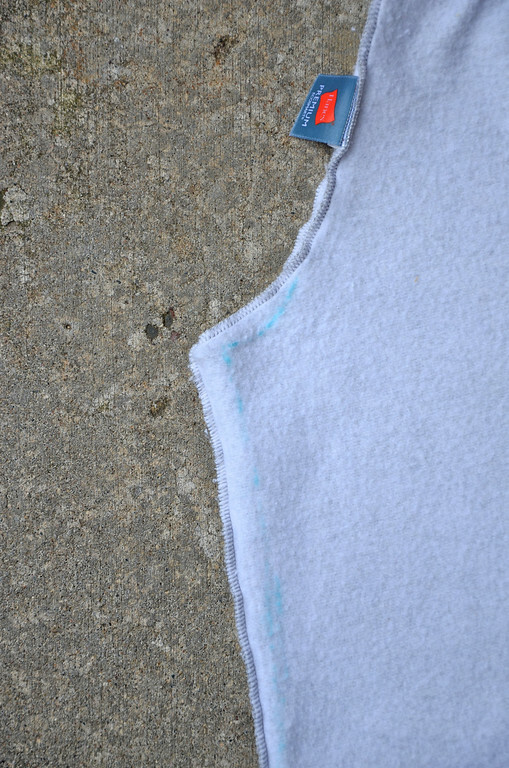 The new inseam was then sewn (see white serger stitches), followed by the new crotch seam (where the pins are). 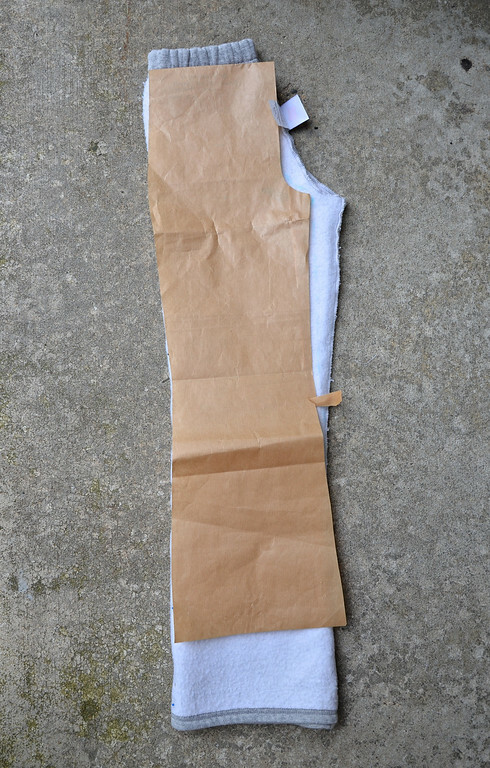 This is the final fit after realigning the crotch seam and inseam. 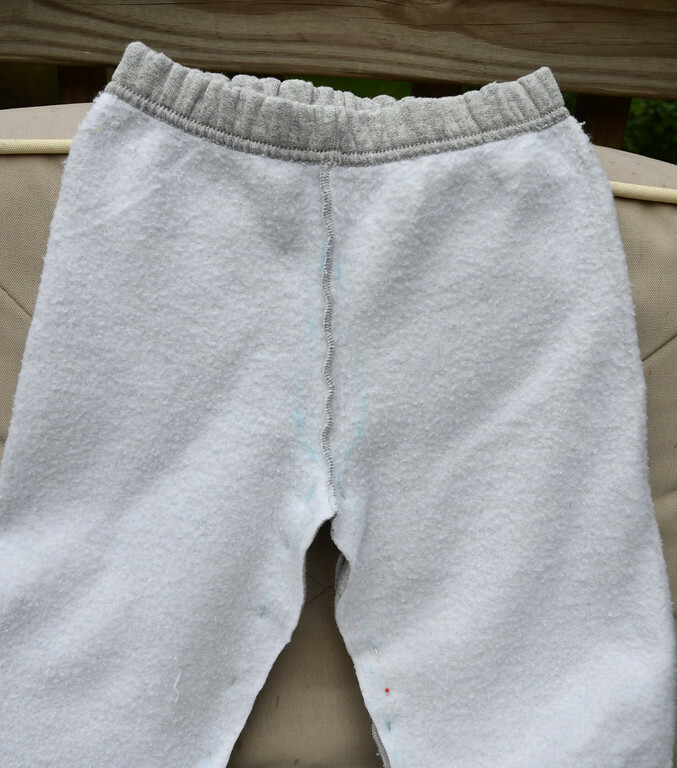 It is still a roomy fit, being sweatpants after all, but they now sit at the waist and crotch instead of sliding down the hips, without my having done anything else to them. 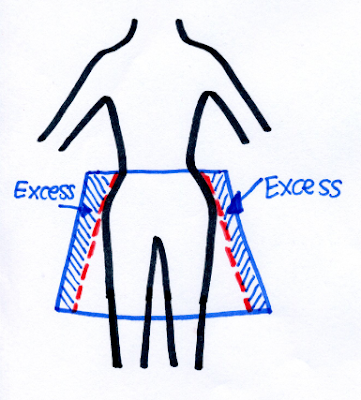 Q: Can we use this method for letting out a garment (making it bigger)? A: Only if the seam allowances are wide enough. Often, commercial garments have narrow seam allowances which are serged, so you may not have much wiggle room, literally. I leave you with one last photo - this is an old knit shirt I have and love. 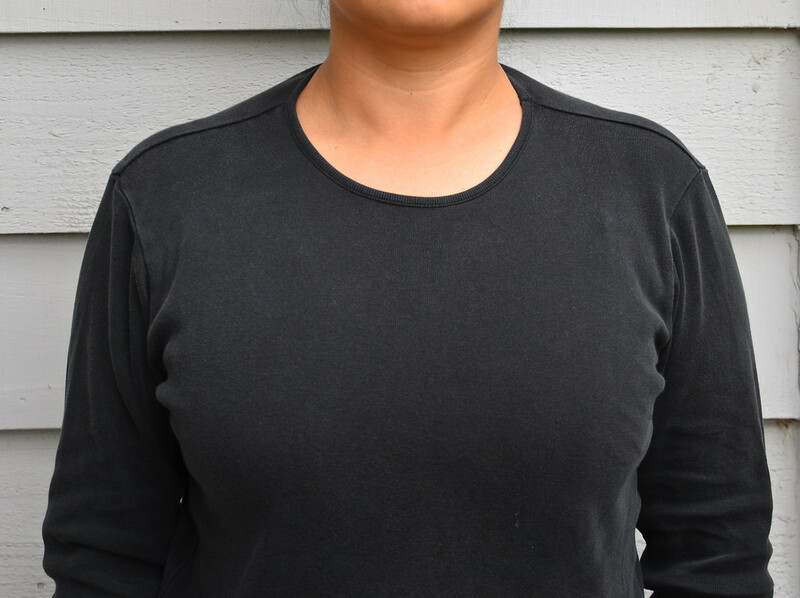 But the back of this shirt was cut too wide for the back of my neck, so that when it is pulled snug around my shoulders, the shoulder seam dips over to the front, and you actually see the back of the garment peeking over my shoulders. Not good. 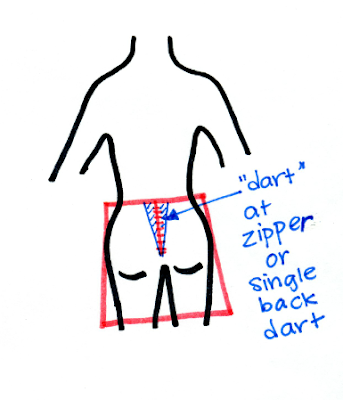 If it had a back seam (like where a zipper might be), I'd insert a central dart at the neck, or shape that back seam on either side of the zipper. But it's a knit shirt, so no such luck. Instead I might have to realign the shoulder seams, and take in ease only in the back shoulder, without changing the front shoulder at all. It would be very easy to make the mistake of symmetrical shoulder alteration and "sew in" that shoulder seam, taking in ease from BOTH the front and back. I'd be left with a higher front neckline (not bad in itself), folds in the center bust region (bad), pulling diagonally towards the armpits (bad) and who knows what else. Clearly I'm not going to take my seam ripper to this shirt, not for the work just to alter those shoulders. I'd rather live with it and keep pulling the shoulder seams backwards and grow out my hair to cover that gaping neckline in the back. Sad, but realistic. In the next post, we'll look at how to alter a hideous armscye! Case A: Do not trim off those excess seam allowances. You'll need them for when you gain the weight back. Case B: If you've lost that much weight, forget the alterations. You DESERVE TO BUY A NEW SKIRT! Buy! 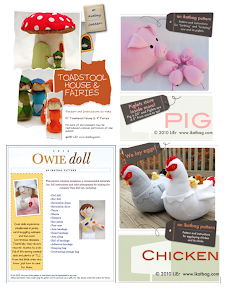 Don't Sew! It's what I've ALWAYS said! I'm so glad I found your site! I have about 10 skirts I picked up cheap that need altering. I have done the side seams in the past but have not yet tried the darts, now I'm inspired. Thanks! I want to learn to alter super sized shoulder pads shoulder to normal shoulders. I bought a jacket that I am going to experiment with. Sites like yours have given me the courage to attempt this. I have also bought some shirts that were too big for my waist, hips and shoulders. I made darts at the neck line in the back and fixed one problem and took the sides in at the waist and fixed that problem. Would the darts at the neck line help with the back being seen in the front? JustPam - yes! Shoulderpadless shoulders coming up in the next post. I must have read your mind. This is fantastic! Thank you for the clear explanations and pictures. Seriously I need to make some slopers then attack my sweats. ha. I came back to this post for help, and wanted to share my "problem." I bought a pair of courderouy pants, without trying them on, first. They were a bit snug, and I put them away. I *did* lose the weight, but too much! Now they fit nicely in the hips, but way too lose at the wait. Here's the kicker- the manufacturer actually inserted the opposite of a dart- a triangle of extra fabric- at each side seam. What is that called? Maybe just terrible workmanship. I think all I will have to do is remove those triangles, fix the tailored waistband, and I'll be good to go. One Yard Wonders Book Launch!